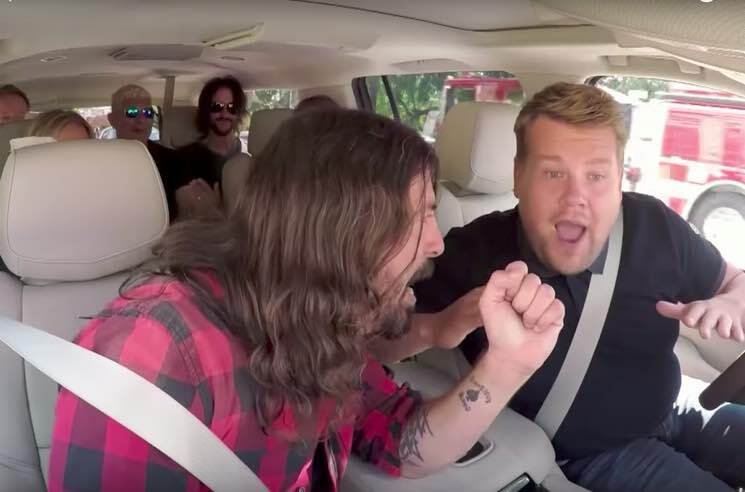 A couple weeks ago, Foo Fighters joined late night TV host James Corden for his "Carpool Karaoke" segment on The Late Late Show, but apparently the filming process wasn't as fun as the Foos made it look. In a new interview with NME, the band opened up about their experience in Corden's car — and apparently driving around L.A. shouting along to your own songs for hours on end isn't that enjoyable. "By hour three in dude's car it got less fun," guitarist Pat Smear said. "It kinda went on. When we stopped at Guitar Centre, that felt like we were done, but it was like 'this is halfway.'" Dave Grohl also revealed his reservations about the viral clip, assuring the interviewer that Corden's "a very nice guy," but he admitted that the filming was a little uncomfortable. "I don't mind singing my own songs at Glastonbury or the O2, but if I had to sing you a song right now, I'd be too embarrassed," he said. "We did the Ramones, and Rick Astley, but they didn't use it," Grohl added. "I don't know why." The hours of footage eventually got whittled down in 12-minute clip. You can check out what did make the final cut in the player below.